Today we are showing off a render of a pistol that will be arming the Finns in the next release: the Lahti L-35. In the 1920s the Finnish Army were working to replace the multitude of older weapon designs in use and move towards domestically produced weapons. in 1929 Aimo Lahti received a request to design a new pistol to be tested against the existing Lugers. While externally similar looking to the Luger, Lahti's design was internally very different. Although a strong and sturdy looking design, it was not completely capable of handling the hotly loaded 9 mm ammunition intended for the Suomi submachinegun, which would over time crack the pistol's slide. 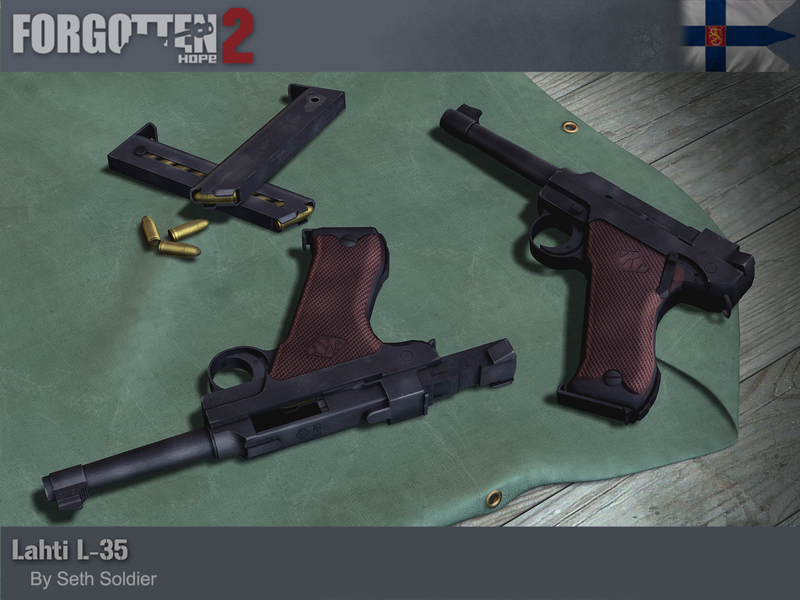 Several thousand L-35 pistols were delivered to the Finnish Army before the end of the War, never managing to replace the Luger. Our Lahti was made by Seth Soldier. You can download it using the Community Updater, in the rare case where this fails try the "Repair Installed" button.